Artificial intelligence (AI) is infiltrating all industries, meaning a transformation in the way we live our day-to-day lives – and the way we work – is inevitable. But this is nothing to be afraid of and we should embrace AI to improve the way we work. According to Adobe, 15 % of companies currently use AI, with 31 % expected to adopt it over the next 12 months. This significant technological disruption is set to affect everyone in some form, and many are worried that AI will displace our jobs and make humans irrelevant. However, Reed Accountancy & Finance research found that almost half (47 %) of finance professionals asked are enthusiastic about AI in the workplace and are willing to embrace new technology. This shows there is a lot of enthusiasm about all the ways AI can improve our everyday activities. With this in mind, here are five reasons why we shouldn’t be panicking about the introduction of AI into the workplace. Research from Deloitte shows that 61 % of companies are now actively designing jobs around robotics. However, it is expected that, in the coming years, the skills and traits that make us human and enable us to interact effectively will become increasingly important for employment and career advancement. While machines and AI will be capable of performing many routine tasks, human cognitive skills will still be sought after, so businesses will still need to target candidates with these talents. The introduction of AI will also free up time for creative thinking and judgement work – areas in which humans are naturally superior. AI can design solutions to complex societal issues, but only humans can implement them, as well as display empathy and compassion in a way machines never can. A study by Accenture has revealed that AI could increase productivity by 40 %, and profitability by 38 %. This is in addition to our own research which found a third (32 %) of finance professionals believe AI will improve productivity and efficiency by having the capabilities to report and summarise accounts taking away the menial tasks – understandably, businesses are interested. This means employees are free to concentrate their efforts on more stimulating, forward thinking work, making companies using AI very attractive. It can also help with recruitment, where AI can source, rank and arrange interviews with candidates. 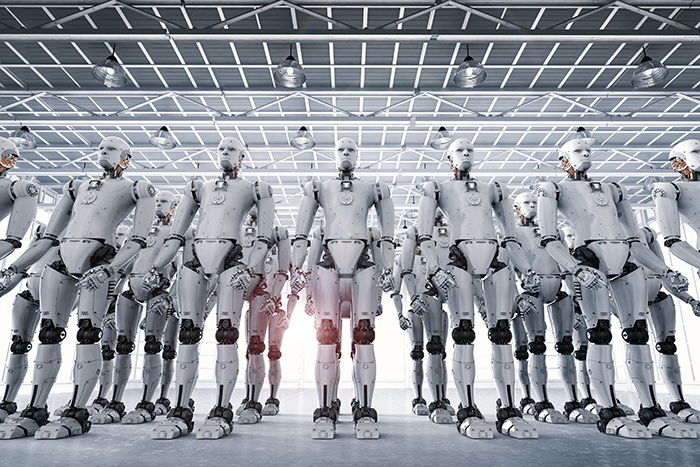 More accurate forecasting, predicting maintenance and repairs, personalisation, optimising manufacturing and replenishing stock automatically are all areas in which AI can also help companies become more efficient working within their budgets. By 2030, it’s estimated that Generation Z will represent 75 % of the workforce, meaning innovative methods of appealing to this group must be a priority for all organisations. One way to do this is by promoting the use of AI in the workplace, as this generation appreciates the value that technology brings. The use of AI-driven foundational technologies, such as blockchain, may also help companies that are based on this technology present themselves as the more fashionable, innovative places to work. Unconscious bias has long been an issue in recruitment, and for those responsible for recruitment in an organisation. Some tech start-ups are already using AI to perform initial interviews, along with facial recognition software to detect body language and emotion cues when screening candidates, in order to eliminate the unconscious bias that is so often found in the human decision-making process. In fact, according to KPMG, 60 % of HR departments are planning to adopt cognitive automation in the next five years with the aim of making recruitment a bias-free procedure. McKinsey research has found that, if AI is adopted by 2030, eight to nine % of labour demand will be in new types of jobs that didn’t exist before. History would suggest that, after a large technological disruption in society, over time, labour markets would adjust in the favour of workers. However, the skills and capabilities required for any job will shift, with the need for more social and emotional skills, such as logical reasoning and creativity, making candidates with these skills in heavy demand. Navigating the unchartered territory of artificial intelligence can be daunting, but there is no need for businesses or candidates to panic. If used in the right way, AI can be incredibly helpful and vastly improve the effectiveness and efficiency of not just many organisations, but our everyday working lives.